Zewa’s new SpaBuddy Mini GO TENS unit is lightweight, wireless, portable and powerful. It connects to a large 3” x 4” pad that covers a large enough area to provide a good, deep penetrating treatment. 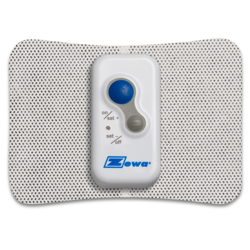 The SpaBuddy Mini GO features 3 alternating TENS programs that can be used at any body location. Compact, Portable and Lighweight Design make it easy to place device on any body location. 3 Alternating TENS Programs provide different treatment options. Wire Free operation. Device is placed directly on 3" x 4" Pad. 10 Intensity Levels make it simple and quick to adjust the strength. Automatic Timer will turn device off after 20 minutes.